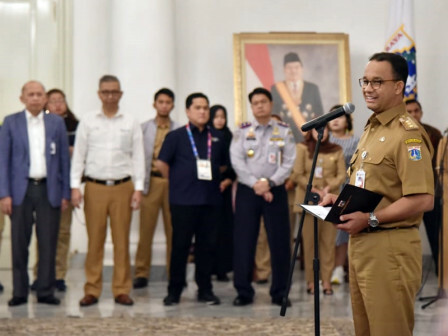 Through PT Transportasi Jakarta (Transjakarta), Jakarta Provincial Government is about to facilitate free transportation for journalists who will cover the Asian Games.
" This is a positive initiation of PT Transjakarta to provide free services "
The transportation facility, can be used by journalists, either from in and outside the country by using special cards from August 10- September 15, 2018. Jakarta Governor, Anies Baswedan appreciates the policy of PT Transjakarta to present the ease of transportation facilities for the press. "This is a positive initiation of PT Transjakarta to provide free services to media crews, press people or journalists," he expressed, at City Hall, Monday (8/13). Aside that, she added that this free transportation is also provided for Asian Games volunteers. "There are around 13,000 volunteers who also provide ease of transportation for free," he stated. As for the information, PT Transjakarta also provides free services using 1,750 Transjakarta buses for residents on weekends during Asian Games.